An unprecedented cultural exchange between the National Portrait Gallery in London and the State Tretyakov Gallery in Moscow — marking the 160 anniversary of the foundation of both galleries — Russia and the Arts is a once-in-a-lifetime opportunity to see masterpieces that rarely leave Russia. Presenting celebrated portraits of key figures from a golden age of the arts in the country, it is one of the most important Russian exhibition ever to take place at a British museum. This exhibition features iconic portraits of 26 Russian cultural heroes, painted between 1867 and 1914, the 50 years leading up to the first world war. These writers, artists, philosophers, actors, composers and patrons between them created an extraordinary cultural upheaval and the angst of this particular political turmoil is reflected in these portraits. The writers, such as Dostoevsky, Tolstoy and Chekhov, are even today seen as radical and visionary creators, the fore fathers of modern culture. In parallel to this upheaval in writing, Russian painting was developing a self-scrutiny and self-confidence with a penetrating realism. Ilya Repin is perhaps the best known of this group outside of Russia, as he played a major role in bringing Russian art to the attention of Europe. But artist like Perov, Kuznetsov and Della-Vos-Kardovskaia were all new to me in the flesh, as their works are rarely seen outside of their country. 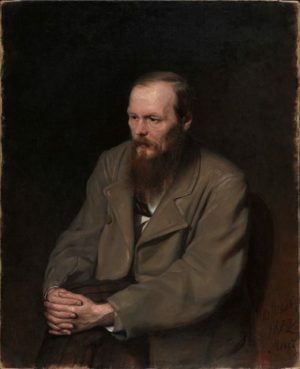 The Perov portrait of the ghostly pale Dostoevsky is astonishing. Surrounded by darkness, he stares downwards into the darkness, away from the viewer and self absorbed. Through his thin, taut skin you feel you could touch his skull. His downcast attitude, his scruffy oversized coat and too firmly clasped hands present him as an epitome of one of his own characters. These are the most intense and revealing portraits. Somehow, they use the exterior to reveal the interior of the human; and this interior is presented to us for our intimate scrutiny. For me, these paintings offer the illusion, strangely, that we are actually meeting the person. 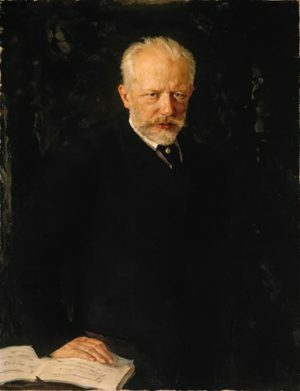 The controlling but frail Tchaikovsky, the vulnerability of mortality in the portrait of Vladimir Dal, these works have a painful sensitivity. It must have been an extraordinary time to be an artist, as these paintings are a counterpoint to the searching in the works of the writers and composers that are the subjects of the paintings, but they are presenting the human frailty, vulnerability and self-knowledge in a way that is almost overwhelming. This show, although small, forcefully reminds us of the delights the psychological, insightful painted portrait can give, which at its best can represent all of humanity. This is not something that is found in abundance today. However, there are a few exceptions, and, more importantly, there is a growing interest in learning how to create realistic, revealing portraits, especially in the USA. All of these artists went through thorough strict academic training. Repin himself went to the The Russian Academy of Arts in Saint Petersburg before breaking away from the constraints imposed by the state teaching with a group called the Wanderers. They were strongly committed to individual psychological drama, portraiture, and scenes of Russian history, but they also had a profound interest in contemporary life. These masterpieces have come from an original collection put together by Pavel Tretyakov, which became the core of the State Tretyakov Gallery in Moscow. This Gallery is now firmly on my list of places to visit. The Russian part of this cultural exchange is in the Tretyakov Gallery and entitled From Elizabeth to Victorian: English Portraits from the collection of the National Gallery. Russian and the Arts is in London until the 26th June 2016. All images: © State Tretyakov Gallery, Moscow.